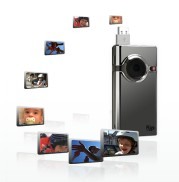 CISCO-owned Pure Digital, makers of point and shoot camcorders such as the Flip Mino HD, have launched their own video sharing site dubbed “FlipShare.com”. One of the biggest selling points of the Flip range of camcorders is the software that they come bundled with (installable from the camera itself), which enables basic editing and upload to YouTube and other third-party video sites. So why launch a competing site of their own? Two words: Privacy and convenience. The idea is to make it easier for less tech savvy users to share their home made movies with friends and family privately. While YouTube and other sites already offer the option to make videos private, the process can often be a little convoluted and involves getting others to sign up to the service and adding friends etc. FlipShare will not only appear as an upload option in the FlipShare software itself but sharing consists of adding the associated email address of those who you want to view your Flip Channel, who will then be sent log-in details. Picture quality is said to be on par with other video sites, including where applicable, HD. Access to the site isn’t limited to the PC either, with an iPhone app already available and a TV solution (set-top box) already in the works. Flip's home movie set-top box launches – wrong target audience?